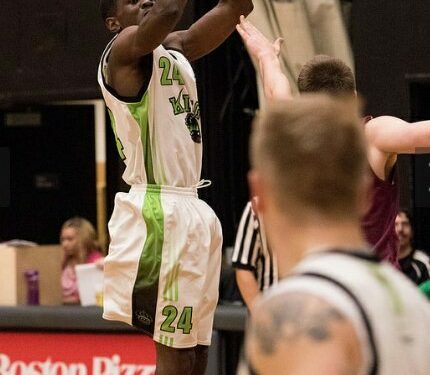 Anthony Ottley is a journeyman, having played at the JUCO (Kilgore), CIS (Trinity Western) and CCAA (Durham) levels, with ambitions of the PROS next year. While at Durham, Ottley lead the nation in scoring, averaging 26 PPG. This season is going how we would want to imagine in the first half. Being 9-0 in the first semester is something that shows how well we can play as a team. The thing I like the most is the ceiling that we can reach as a team; we feel we can only get better from here. My teammates who have stepped up late in the semester has propelled us to become even better and will continue to help us in the season. Dallas Hancox the 6’8 center from here in Red Deer has emerged as one of the league’s top shot blockers and a guy who is a intimidating presence on the defensive and offensive boards. Another two teammates who have stepped up through adversity as rookies are Michael Gini from Kelowna, BC and Kelvin Omojola from Las Vegas, Nevada. Ian Tevis (Seattle) has taken the outside scoring up to another level by becoming the second leading scorer in the country. Matt Matear (Calgary, AB) has become the 10th best rebounder in the country at the break and one of the most mobile big men in CCAA. As for myself, I played with a strained hip flexor at a point and with a left slight sprained ankle at times, but I pride myself on playing through it. Injuries of any kind can be a set back but that’s where in season toughness comes into play. We don’t have one specific leader on the team but instead a team of leaders who create winning habits and mentality. Playing at Red Deer this season I have noticed we have a lot of talent where I can play off ball a lot more, and work on being a better team player as well as individual. Besides the talent we have on this year’s roster, our coaching staff has helped us stay focused on the motto “defense and layups.” The way we train throughout the first semester is not to be an average CCAA team but to be a great basketball team overall at any collegiate level. Whether its the weight room, on the floor, film sessions, eating right and even in therapy treatments; taking care of your body–whatever we do, we do it to a level of excellence every time. Every week we have a fitness test determining who can make the roster for that game that weekend. This holds us accountable to meet the standards of the program and being a pro. In the next semester we don’t plan on letting up, we plan on doing better and more to reach our aspirations. Most teams would be excited to be 9-0 at this point but we are excited for the opportunity to excel; and play for the ACAC title and a CCAA National Championship for a shot at gold. Right now we take it one day at a time, one game, one practice and every team session. We pride ourselves on not looking into the past and relaxing on how well we start off. Your comfort zone is usually when you are satisfied, and can find your self being complacent easily. So we exercise motivational words such as “Do More” like I explained in my first diary. We let it motivate us to get better and keep building on what we have already accomplished. This holiday we are resting but while we rest we still get in as a team and get in practices, scimmages weight room and eat properly to get rejuvenated for January. Im excited to move on forward to our destiny. I love this game. Thank you for reading and stay tune for more in future! Anthony Ottley (Trinity Western Bound) With SICK Crossover Pull Up!